As many of you that follow this website know, I am a big fan of pitcher Bailey Clark. From the moment he touched down in Eugene in 2016, I was easily impressed by the quality of pitches in his arsenal. However, the first two summers have seen him struggle with minor injuries that limited his ability to train in the off-season. After getting things straightened away after 2017, Clark had a dominant spring at South Bend in 2018. First he came out of the bullpen for the Cubs and then he morphed into a starter. It didn’t take long before he was on his way to Myrtle Beach where he kept starting. However come early June, Clark hit the shelf for a while. When he returned in August, he was coming out of the bullpen again and quite effectively. Between the two class A affiliates, Clark had an ERA of 1.89 with 63 strikeouts in 57 innings. He threw 95-97 most nights with a devastating/slider that just baffled class A hitters at two levels. His 2018 story didn’t end there. Clark made his way to the Arizona Fall League and had an outstanding first half there and made the All-Star team. Clark slipped a little bit in the second half in Arizona, but overall it was an outstanding experience to do well against that level of talent. 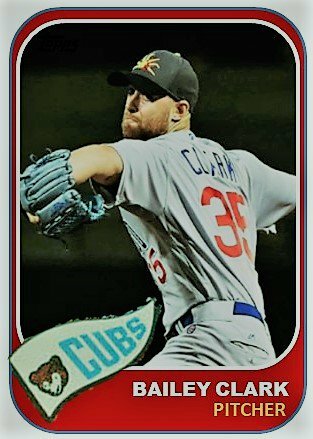 Heading into spring training, Clark looks destined to head to AA Tennessee to begin 2019. I thought he might get in a few games with the major-league club this spring because they of his experience in the AFL, but that did not happen. Then again that doesn’t mean Bailey Clark is not on their radar. 1. Health – He has struggled with injuries the last three seasons whether it was at Duke or as a pro. For him to continue to move toward Chicago, health is of paramount importance. He’s got everything he needs. In fact, he has always had the talent to make it to Chicago. But it’s always been about putting in a full season on the mound. 2. Role – As a starter, he was throwing 95 miles an hour but it ticked up a little bit to 97 out of the pen. 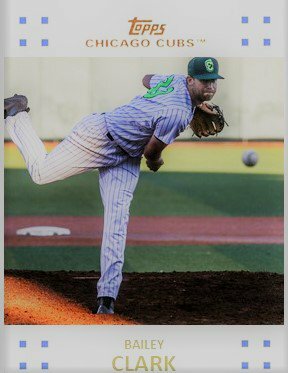 Combined with his slider, he can be a two pitch kind a guy who I could foresee coming out of the pen in the seventh or eighth inning fairly quickly. 3. How Fast Could He Move – That’s the big question, isn’t it. He has amazing stuff that just needs a little bit more experience. Pitching in Tennessee is not gonna be that far off from pitching in the Arizona Fall League.The talent level in the Southern League is going to be pretty close to the same. I could see him coming out this spring and doing well but he’s going to have stay healthy in order to move. There’s no one with his kind of talent out of the bullpen from AA on down. He’s on a level with Dillon Maples and James Norwood in terms of pure talent. They are essentially pitchers with major league pitches. And not just any pitches, pitches they can be successful in Chicago. Let’s hope Bailey gets there sooner rather than later.